In law, the assent by one party to an offer made by another, or to any act which becomes operative only by such assent; in commerce, the question whether the assent has been given before the withdrawal of the offer or incomplete act arises most frequently over "time contracts," when two parties seek to agree upon buying, by quality or quantity only, at a future time goods or effects not identified; as, so many bushels of red wheat, so many pounds of mess beef. This class of contracts is void according to Talmudic law: no one may sell what he does not own at the time, for instance, a fisherman may not sell his next haul, nor a son his share in a dying father's succession, nor may one who is still bargaining for the purchase of a field sell the field to a third person (B.M. 16a, b). Exceptions to the rule are allowed only on the score of a pressing emergency. (Mishnah B. M. iv. 2). "He who punished the generation of the Flood and the generation of the Dispersion will punish the man who does not stand by his word"
Even where a specific thing, whether land or chattel, is the subject of a bargain, the Talmudic law does not seem to distinguish between a sale and an "executory contract," that is, an agreement to sell and to buy, though there are "purchases on condition." The question as to when the minds of buyer and seller have so far met that neither of them "can go back" can be treated under the head of Alienation only; for it is merely a question of change of title (Ḳinyan), that is, as to what precise moment the title in the thing sold or exchanged vests in the buyer. The older Roman law similarly did not recognize executory sales; for emptio et venditio was a real not a consensual contract; that is, it became binding not by consent of the parties alone, but by the bodily delivery of the thing sold according to prescribed forms. The question of the acceptance by the wife of a bill of divorce written by the husband is extensively discussed in the Talmud. Strictly, delivery only is necessary. Scripture says, and he shall "give it in her hand" (Deut. xxiv. 1), which, according to the oldest authorities, is complied with by putting it "on her roof, in her yard, or on her shed," even without her consent. For the requisites of delivery, and how the wife can hasten it by a voluntary acceptance through her agent, see Divorce. 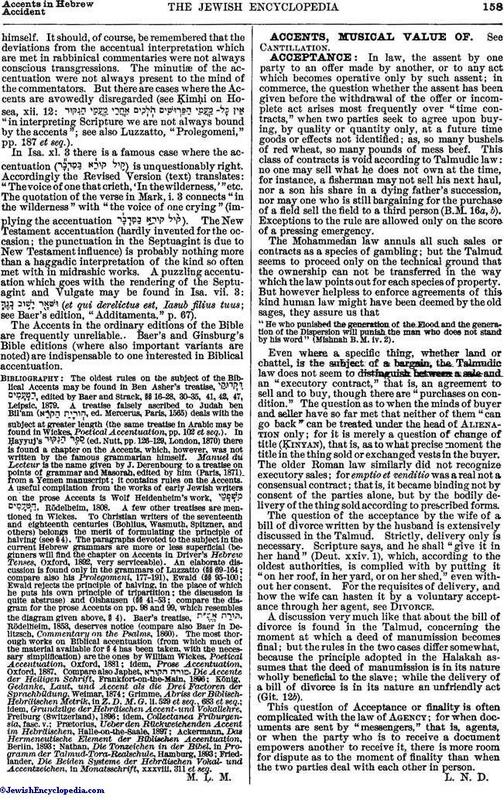 A discussion very much like that about the bill of divorce is found in the Talmud, concerning the moment at which a deed of manumission becomes final; but the rules in the two cases differ somewhat, because the principle adopted in the Halakah assumes that the deed of manumission is in its nature wholly beneficial to the slave; while the delivery of a bill of divorce is in its nature an unfriendly act (Giṭ. 12b). This question of Acceptance or finality is often complicated with the law of Agency; for when documents are sent by "messengers," that is, agents, or when the party who is to receive a document empowers another to receive it, there is more room for dispute as to the moment of finality than when the two parties deal with each other in person.